We are are always willing to take the time to consult with you regarding the works of Eric Sloane because we want you to be informed. We have decades of expertise in cleaning, repairing, and restoring Eric Sloane paintings. We also offer comprehensive formal written appraisals for insurance, Internal Revenue Service, or inheritance purposes for a very competitive fee. We strive to bring to our clients unique and unusual items as well as “new to market” paintings of exceptional quality to appeal to the discriminating collector. We own the paintings we sell – there is no greater testament to the confidence we have in the quality and value of what we have to offer to you. We sell those works by Sloane which represent the highest levels of his skills, works in which we have the utmost confidence in the quality, condition, emotional impact, and current and future value – and we use our own capital to do so. We encourage you to visit and browse our selection in a unique and relaxed environment and we always welcome your questions. We offer a comprehensive appraisal service for our clients in need of a professional, written appraisal for insurance, Internal Revenue Service, or inheritance purposes. Our appraisal process is research-based and data-driven, specifically designed to protect your financial interests. A formal appraisal, complete with a comprehensive written description, value assessment, and multiple photographs is just $250.00. Members (Sponsor level or above) of the Friends of the Eric Sloane Museum receive this service for free if they prepay for two years. This level of membership also includes a signed and inscribed copy of Aware: A Retrospective of the Life and Work of Eric Sloane. We provide prompt, courteous, professional and confidential service, always take the time to answer your questions, and always treat you honestly and fairly. We provide immediate full payment in the form of a bank cashier’s check or in cash. We are always seeking quality works by Eric Sloane. Check with us before you sell – we strive to pay the highest prices. Contact us via email or by calling 570-204-2906. When it comes to cleaning or restoring works by Eric Sloane, no one can match our experience or our results. You can have the utmost confidence that we will treat your painting with an exceptional level of professional care. Paintings by artist Eric Sloane are the only paintings we clean at Weather Hill – we have the expertise to perform mild cleanings to complex restorative work. All paintings need a gentle, professional cleaning on occasion. Even in the cleanest of household environments, paintings accumulate dust and dirt from interior and exterior sources, including most forms of domestic heating. Cleaning and, if needed, varnishing removes harmful contaminants that can damage the paint over time. Cleanings need not be expensive. 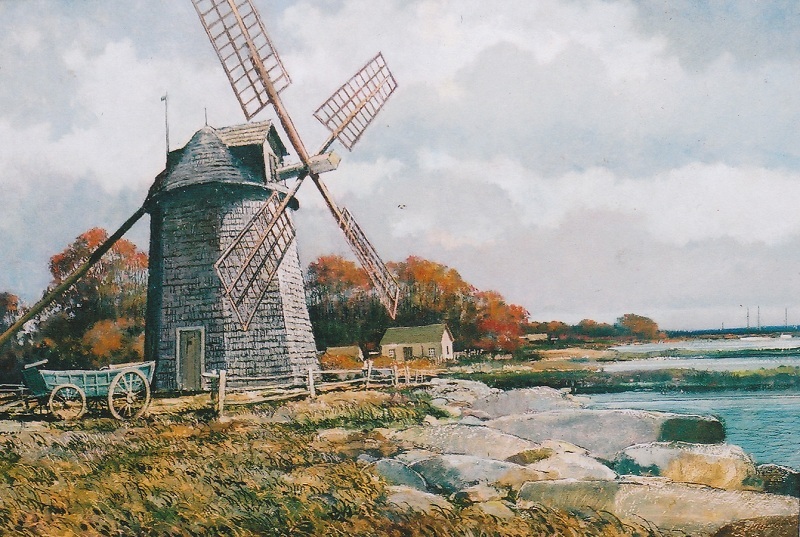 Coming Home by Eric Sloane, pictured above, wasn’t cleaned since it was painted in 1945. A thorough and careful cleaning not only protected the painting, it also improved the painting a great deal and cost only $150.00. Coming Home is one of the few Eric Sloane paintings I have ever seen that is dated (Sloane admitted to having a fierce aversion to dating anything), and in this case the date is significant. Coming Home was commissioned by the wife of a World War II combat pilot shortly after V-E Day. Janie asked Sloane to paint a picture of her husband Warren flying home to her in time for Christmas, 1945 (note the holly leaf and berries in the inscription below, which appears at the lower right of the painting).